Further details can be found here. Everyone welcome. 10.00-10.25 “How Effective is the Comparison between Malebranche’s Occasionalist Causation and Dogen’s Soto Zen Buddhist Practice? 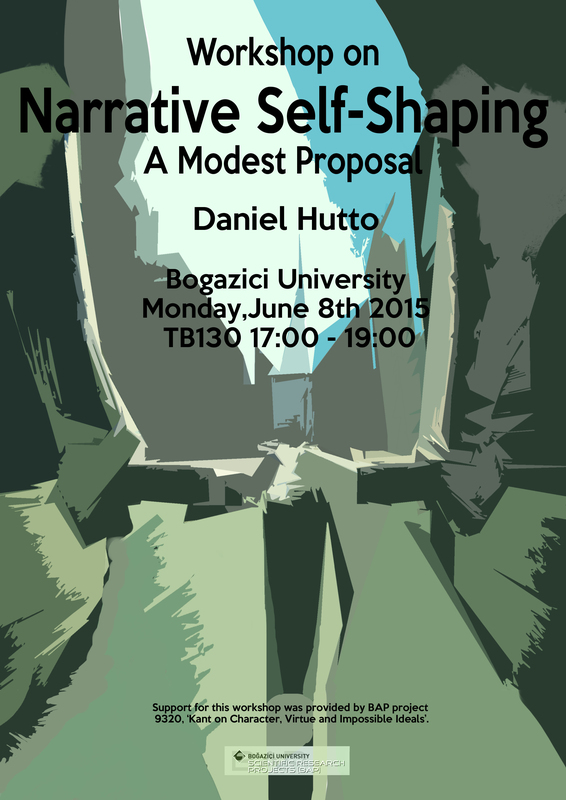 Daniel Hutto will give a talk at Bogazici in TB130 entitled “Narrative Self-Shaping: A Modest Proposal” on Monday June 8th from 5-7pm. Everyone is welcome. 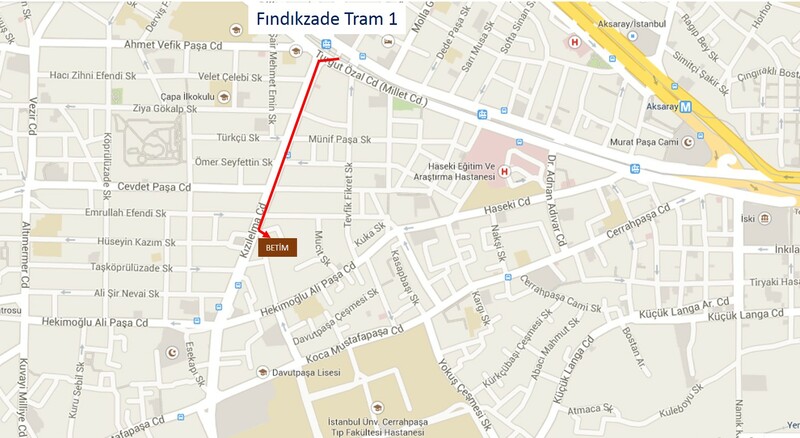 Details on how to get to Bogazici by metro can be found here. And here’s a video showing how to find the TB building. Daniel Hutto is the author of many books, including, Narrative and Folk Psychology (2009, editor), Folk Psychological Narratives: The Sociocultural Basis of Understanding Reasons (2007), Narrative and Understanding Persons (2007, editor), Wittgenstein and the End of Philosophy: Neither Theory nor Therapy (2006), Beyond Physicalism (2000). His latest book, written together with Erik Myin is Radicalizing Enactivism: Basic Minds without Content (2012). 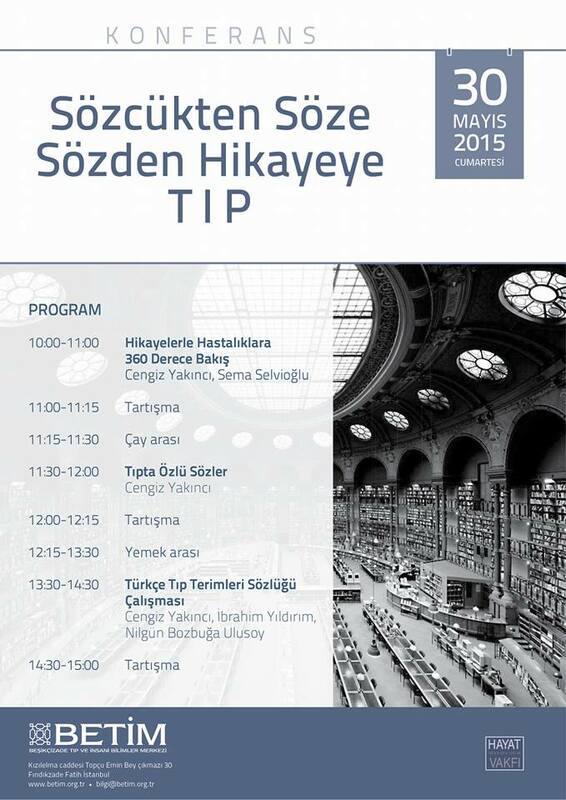 Prof. Hutto and Prof. Myin will be presenting a draft of their new manuscript at a conference at Bogazici from June 9-11, 2015. Details of this conference can be found here. 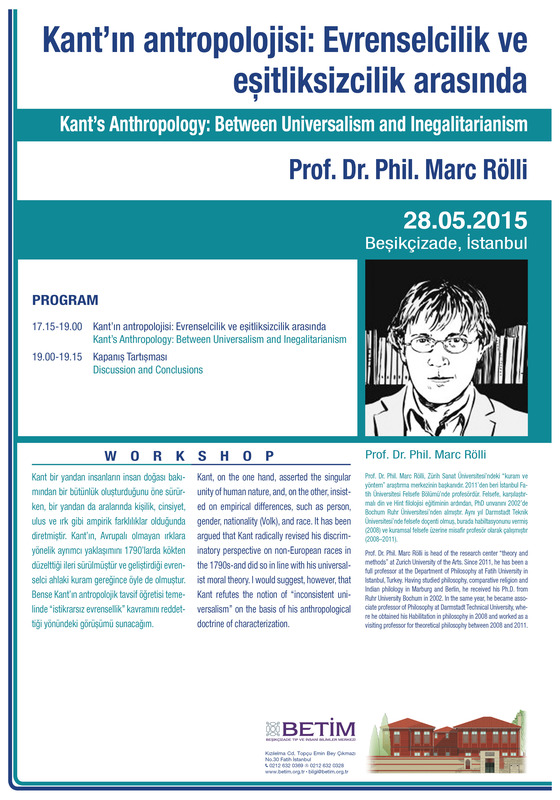 Support for this workshop was provided by BAP project 9320, ‘Kant on Character, Virtue and Impossible Ideals’. A video of how to find the Demir Demirgil Salonu once on campus can be found here. Directions explaining how to get to Boğaziçi University by metro can be found here. I have Inserted links to some of the talks into the program below and will add links to new papers if and when I receive them. Everyone welcome! 2:30-3:30 Anita Leirfall (Bergen, Philosophy) “A Proto-Proprioceptive Affected Causal Power of Thinking? 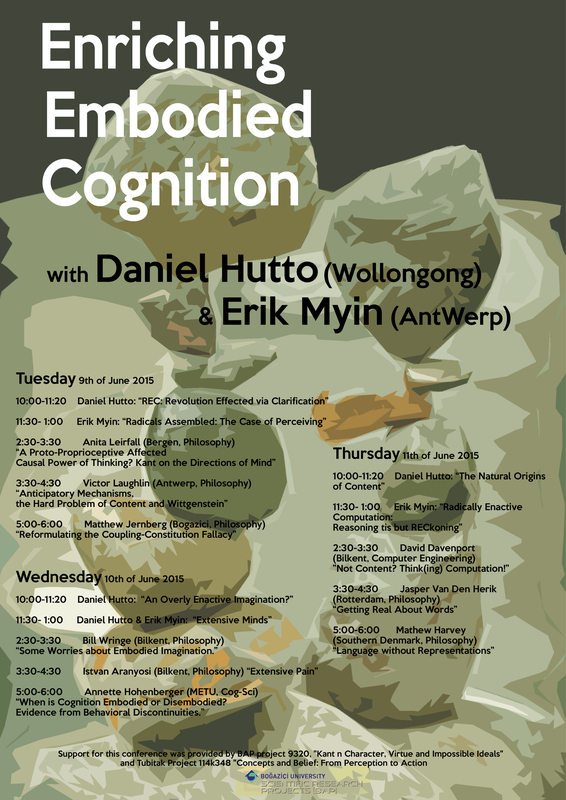 5:00-6:00 Annette Hohenberger (METU, Cog-Sci) “When is Cognition Embodied or Disembodied? Support for this conference was provided by BAP project 9320, “Kant n Character, Virtue and Impossible Ideals” and Tubitak Project 114k348 “Concepts and Belief: From Perception to Action”. I argue for an interpretative and a philosophical claim in this paper. My interpretative claim is that a viable interpretation of Hegel, in distinction from a philosophical position that is merely inspired from him, should accommodate the concept of true infinity in a manner faithful to its meaning for Hegel. The choice of true infinite is not arbitrary. In Hegel’s words, “it is the basic concept of philosophy”1 and “it gives us the nature of speculative thought displayed in its determining feature”2 and involves the conceptual kernel of all of the richer speculative concepts of Logic. An overview of Hegel’s concept of true infinity is presented and its incompatibility with non-metaphysical interpretations of Hegel are defended with particular reference to Pippin and Brandom. My philosophical claim is the philosophical correlate of my interpretative proposal. The speculative turn was purposefully introduced by Hegel to rehabilitate some important deficiencies that he believed was inherent in Kant’s critical philosophy. Hegel’s Logic was intended as a completion of Kant’s project as the true critique of pure reason. The concept of true infinity is at the heart of this speculative turn and represents Hegel’s primary conceptual innovation. According to this, Hegel is neither a metaphysical thinker in the pre-critical sense, nor was he a non-metaphysical thinker. His project was formulating the possibility and actual carrying out of a post-Kantian ontology based on the innovative conceptual resources he introduces through his speculative turn. Understanding Hegel’s speculative turn in these lights and recognizing the centrality of his concept of true infinite in that project should be a step forward in assessing his legacy and domesticating his key insights into contemporary discussions on metaphilosophy as well as the nature of self-consciousness, normativity and autonomy. 1 G.W.F. Hegel, The Encyclopedia Logic, trans. T. F. Geraets, W. A. Suchting, H. S. Harris (Indianapolis, Cambridge: Hacket Publishing Company, 1991), 191.